Today I spent nearly a full day in the garden and yet it does not look like it. This is somewhat disappointing, however its the end vision that keeps me inspired. If I can get the place as lush and productive as last year – or better – I’ll be happy. The priority job was getting the guinea pigs into the chicken’s ‘straw yard” and making it secure. This was easier than I thought it would be as much of the place was closed in already and the addition of some garden trellis made smaller holes pig proof. I have now moved two of the large compost bins into the straw yard as I value the growing space in the garden too much this year! The advantage is also that the chooks enjoy the presence of the extra insect life that is attracted to the bins as well as compost worms and slater bugs. 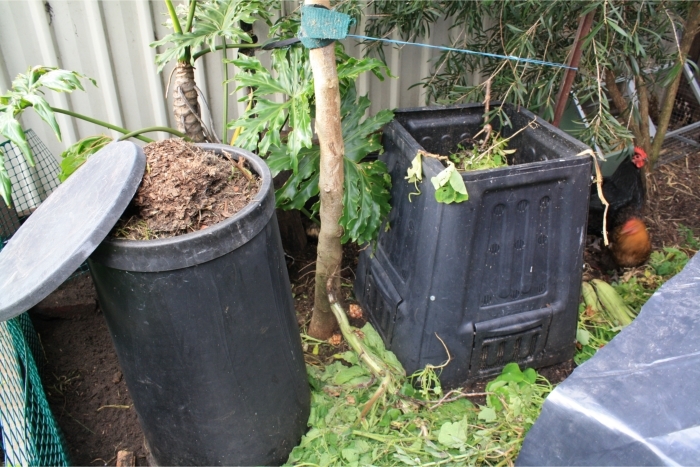 It also is a convenient spot to put some of the scraps that the chooks don’t eat. They are simply raked up and put into the bin to keep the yard somewhat tidy – especially now that it is home to an extended family of guinea pigs. I removed the old hutch that was in the chook yard as the chooks were no longer using it to lay in and it was getting weathered and took up good scratching space. I trimmed the mallee tree and bottlebrush a little and mulched the remaining twigs that had been laying around for a while. 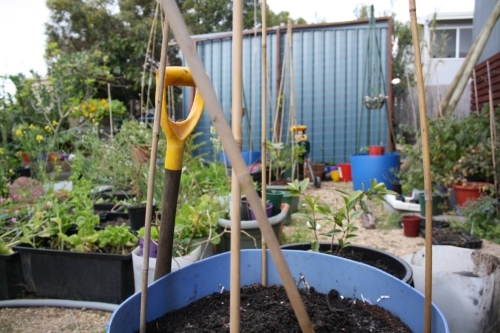 More tripods were made for growing plants up and I even made a bamboo frame for training and supporting a choko on that was well under way with new growth and was located in the corer of the new garden bed. I also found what looked like self-seeded basella which I planted in a large pot with a bamboo teepee to train the plants up. 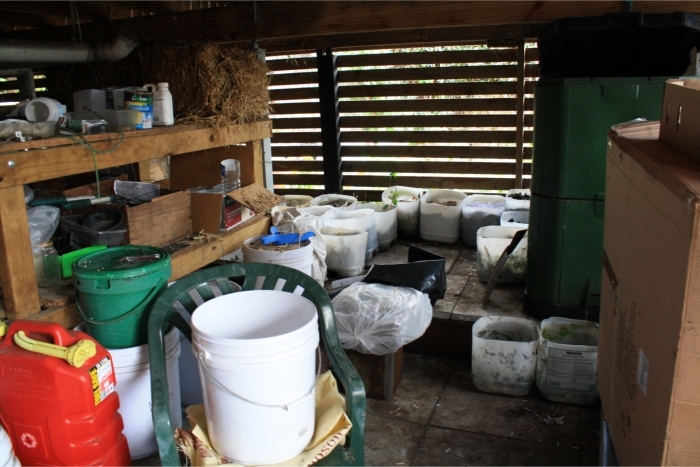 What actually happens is that I will leave these tubs to sit once full for up to twelve months while the worms do their thing and transform the contents into wonderful, dark, water retentive soil. In this way I am using the area under the house in a more productive way and there is no shortage of areas to put the scrap bucket! I even have an aero bin set up which will function in a similar way over an extended period of time. In my experience I have found newsprint and straw to be a much more rich soil than simply horse manure which breaks down very quickly – and then disappears. Newsprint on the otherhand – and hay or straw – make a very dark compost or vermi-compost that has increased microbial activity. Ideally, I will have enough compost and castings to add a top dressing to the large vegetable garden bed each year – if not twice a year! I realise that the garden has evolved from the early plans I had for it and I should do a more recent plan of what is where and what is being used. These tubs are a good example. 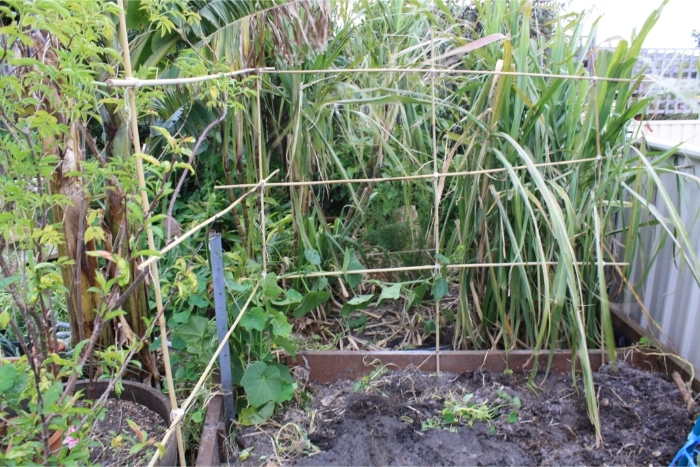 Here is the simple bamboo trellis I constructed today to give the choko some climbing space. I am utilising vertical spaces more this year as I can grow more and it adds to the layers in the garden and will also hopefully break up some of the easterlies when they come in summer. In the garden bed is some of the sludge from the kitchen sink pit where the worms hang around some of the run-off water and food bits and are present in crazy numbers. The soil is literally crawling with them. I also planted our Japanese Taro and water spinach in the vicinity of the pit as the soil is constantly moist and should be ideal for them. They did poorly in the pot and I am hoping with fend for themselves better here. 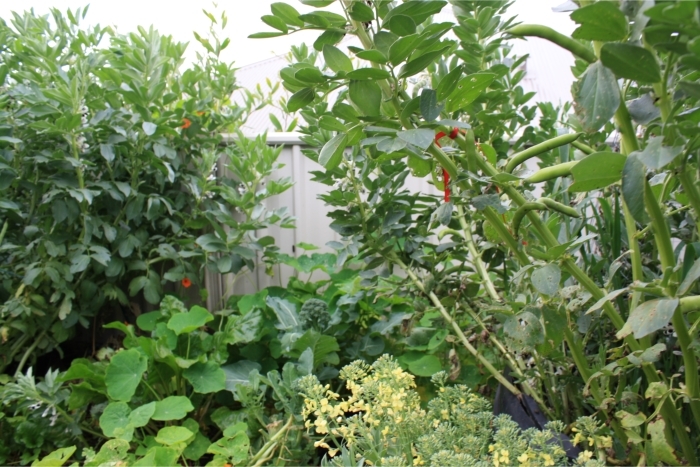 In the image below are the two crops of broad beans I have in at the moment. One is aquadulce – on the left – and the other is more a typical fava bean. I have already marked some with red ribbon so that we know which ones we will be saving seed from. In the foreground is a broccoli that we are also letting go to seed which is currently in flower.